Bachelor of Chemistry Science - Faculty of Science, University of Kufa In 2006 in the first sequence on the stage at a average 82.61 worked as a backup in the laboratory of organic diagnosis of the fourth stage and analytical laboratory for the second stage and the laboratory of general chemistry for the first stage of the Department of Physics.. -Master of BioChemistry in 2011 avarge of 86.78. The thesis title of this research " A study of Iron status and some Red "blood cells properites in primary hypertension " participation in the Najaf Health Conference held in Al-Hakim Hospital on 15-3-2011. 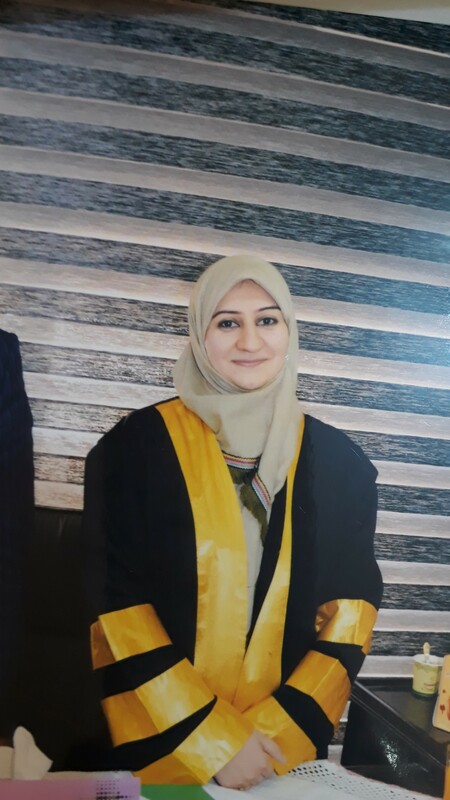 She worked as a lecturer in the Bio Lab for the third and fourth stages Ph.D. in Biochemistry 2017 of avarge 87.87 with Thesis Title "Study of some Biomarkers for evaluation the calcium status in patients with Major Thalassemia major". I am currently working as a doctorate for the third stage in the chemistry department and in the life chemistry lab.